A new $17 million advertising campaign was launched this fall, using take-offs of Milton Glaser's famous 1977 logo to promote all of New York, not just NYC, and messing with the logo generated criticism when it was rolled out in November. Glaser's logo is one of my all-time favorites and has been as effective in branding as Obama's has been. Even though I was there for a short time but was oriented in that direction for 25 years -- I think my few years there as an extended year abroad as I worked on my master's in media studies and vicariously enjoyed Wall Street and all of the culture and art of NYC - I loved the city and the experience and this logo for winter sparked a longing. Now I'm in Santa Fe where the crime is higher per capita than NYC and the police report is the most read section of the daily newspaper. Still, culturally, as our nation's oldest capital city gears up to celebrate its 400th anniversary, the arts and culture pulse heavily here, too and can't help but compare the two as one might put a foot on dry land and the other in a fast-flowing river. Santa Fe has its present foot in the long, long past which anchors the present; NYC flows forward, forward, forward, gushing with momentum and dynamism. Yesterday I read almost all of New York Magazine's Best of Culture issue online. Mine hasn't arrived in the mail yet, but that is the best source for cultural content for the city. New Mexico is not rich in commercial activities but as far as culture, the state has a cultural director. One is (arguably) the center of the world's commerce; Santa Fe is art, culture and tourism, like NYC, but the state of NM ranks 43rd in per-capita-personal-income. Perhaps NYC Mayor Michael Bloomberg would be a better Commerce Secretary and NM's Gov. Bill Richardson might have made a better Cultural Minister? It is the background that makes this perfect for today. UPDATE: A video of these two musicians playing with the World Trade Center in the background was what I'd picked out for a tribute to today. I'm sorry it is no longer available. However, I'm sure we'll see many photos and reminders of 9/11 from today through the election. 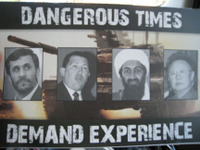 A McCain brochure, at right, arrived in the mail this week with photos of evil enemies reminding us all of the still-existing axis of evil, the War on Terror and enemies all around us. 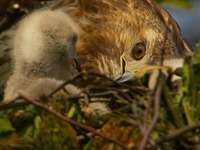 Manhattan's Red Tail Hawks have sad stories with lessons for us all this year. Lola and Pale Male, the red tailed hawk pair of 5th Avenue/Central Park fame, once again could not hatch their clutch of eggs this spring, even though they did everything they could. Their descendents have tried as well with deaths this spring by rodent poison. These are canaries-in-the-coal-mine tales for us. If anyone cares. More on the flip. 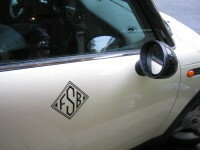 Seen on a Mini Cooper in New York City, the diamond monogram was sleek. Pretty cute, pretty snazzy. Probably only in NYC? I've not ever seen a monogrammed car. Yet the trend for personalization rather than mass consumerism is real and seems a bit more sophisticated than the art cars. 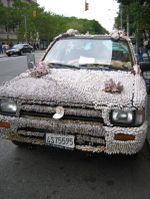 The shell art car, at right, was spotted in NYC, too, on Fifth Avenue. I'd not ever paid attention to art cars until we lived in Houston and the Houston Art Car Parade was a very creative event. This year's Art Car Parade will be May 8, in Houston. In Santa Fe bumper stickers are the epitome of personalization. This place must have more bumper stickers per capita than any other city. In New Mexico old trucks and cars are parked as yard ornaments after they can no longer be driven, and there are more old cars and trucks on the roads. Lowriders are the gussied up cars. 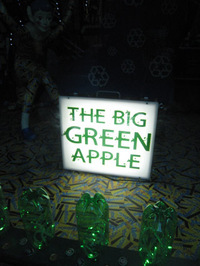 Seems like an oxymoron to me - NYC being the Green Apple, but that is what Barney's is promoting in their big December Holiday display which I think has had the best creative showcases. Last year the windows were all Warhol-ish which I found to be delightful. This year when I walked by them, I took a double take. I just can't imagine NYC being Green when all I could ever see out my windows (beyond my terrace potted plants) was concrete. Yes, that was the view I had from my desk, below left. I just can't see NYC as The Green Apple. Is anyone ever really too old to enjoy Santa? Radio City's Santa is divine -- isn't he precious? Maybe he's the best ever. What a way to start the holiday season -- at Rockefeller Center, the day after Thanksgiving, in NYC. Some people believe Santa is too commercial. Actually, he's a very historical actual spiritual santo -- a holy icon and the idea behind gifts given without strings. In the country now known as Turkey, there once was a Christan Bishop who put coins into the shoes of girls who, for whatever circumstances, couldn't afford a dowry. Hence the origin of Santa Claus. Santa is banned from the home of one of my smart blog friends, KChristyH. I wondered when my children were young if this was too commercial, too fable-like, too untrue to foster, too unreal to perpetuate. However, I love cultural traditions, history and all of the soupy sappy mix shared with loved ones. My first memories of Santa -- a stuffed one with a tiny bottle of coke in his hand. The epitomy of the brand - the Santa as the apex of consumerism. The commercial flood of Christmas makes me gasp for spiritual breath and feel the pressure to give something truly special on a timeline. When we return to Santa Fe, Santa the Man/Saint is not as important as other traditions. Farolitos on Christmas Eve and poinsettas, that original Mexican flower, will be the main festivity along with the big midnight services at the Cathedral in the center of the town and the merriment of the bonfires, carols and crowds up and down Canyon Road. Santa of course here, is the spanish for Holy. Santa Fe... the city of Holy Faith. NYC has them. I guess I shouldn't be concerned. Should I. Bedbugs aren't just a problem in NYC. But latest bedbug advice in New York Magazine is to keep luggage off the ground, away from beds, when traveling. "Check your bags for any signs of bugs when you get home... Seal your clothes in a plastic bag and launder them before returning them to your dresser; you might even want to consider getting luggage you can throw directly in the laundry (e.g., duffel bags)." Nothing like a big parade on NYC streets. Especially when a turkey isn't in our oven but in SaraBeth's. 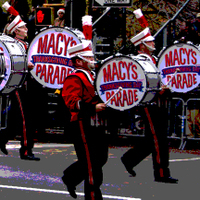 The drum beat of the holiday, Macy's, kicking off the holiday season, ka-ching, ka-ching. In the world's capital of commerce, I'll be having a look-see. My favorite holiday is Thanksgiving... mainly because it is just a time to be thankful and enjoy friends and family and it isn't flooded with commercialism. Traditions are soupy things, too. What we toss in, what we keep, what we savor, what we share. What we aren't doing but would, if we could, would be making my mom's yummy yummy turkey soup. Put turkey bones in large pot, with cover with water, add one onion cut in half and celery heart with stalks and leaves and bring to boil and then turn to low simmer for an hour. Let cool. Skim off fat at top and remove bones and celery stalks (cut leaves into pieces to re-use - same w/ onion halves). In another large pan, heat olive oil then put in carrots, onions, celery and garlic in and saute until tender. Add to soup stock with organo and bay leaf. Simmer for 30 minutes; add shredded turkey pieces to soup. If you use brown rice, add that at the beginning of the simmer process. Otherwise with the other starch ingredients, add them using as much as you wish. (I use relatively small amounts as we are stuffed after the big turkey dinner). Simmer for 30 more minutes on low. Salt and pepper to taste. Serve with love. This is especially good the next day.